When Laura began planning her engagement session with Nick, she knew it had to be fall. The two of them love the fall colors, and living in a place as beautiful as Door County, it was a no brainer. 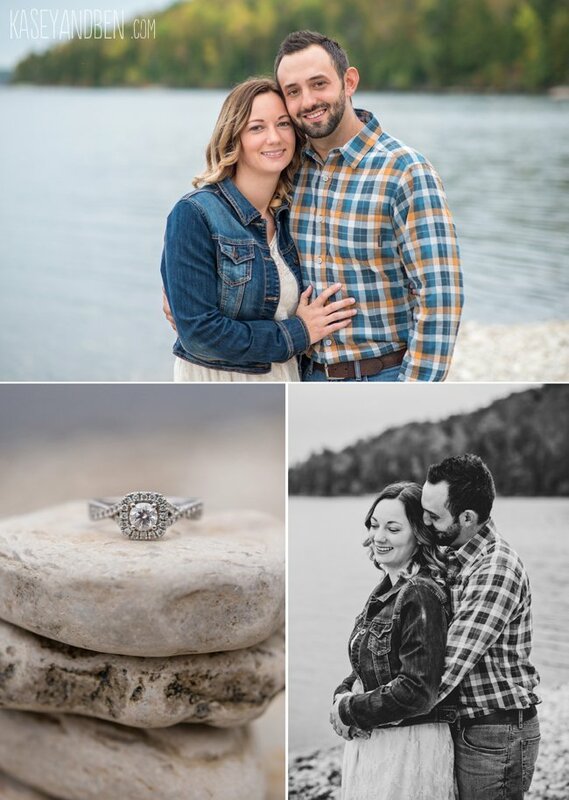 Laura and Nick’s engagement was the last session we snuck in before our baby girl arrived a few days later. Laura and Nick have been together four years. Nick’s plan was to propose on Christmas Eve last year, but he got to excited and couldn’t wait. He popped the question December 23rd and made an ordinary moment extra special. Laura notes that she was taking the garbage out when he asked, and as she says this, she rolls her eyes and smiles at the same time. This tells you everything you need to know about them as a couple; they are spontaneous, romantic, and real. On the day of their session, there was rain in the forecast. We were worried that the weather wouldn’t hold out, but to our surprise the day was beautiful and the fall colors did not disappoint. Laura chose cute outfits with plaid, boots, and a cropped leather jacket which were good compliments to the rust tones of the leaves and the blues of the bay. We enjoyed the afternoon exploring Potawatomi State Park photographing in the woods and along the waterfront. Laura and Nick’s wedding day is coming up on 8-18-18, a memorable date. We are looking forward to seeing all their wedding day plans come together!